More than a year ago, I shared how important it is to give your blog audience the ability to subscribe via email to your newest blog entry sent to them in either real-time or daily/weekly summary. If you have a business or personal blog, you did add that capability, right? :) This year, I'm going to encourage you to take the NEXT step in this evolution and give your blog commentors the ability to subscribe via email to the comment thread they are leaving a comment on. You post a blog entry. Email notification goes out to alert your blog members that a new blog post is available. People comment on your entry. Market conversation runs its course and dies a quick & sudden death. People comment on your entry and get the option to subscribe to be alerted when new comments are added to the same post they are commenting on. Market conversation runs its course over an extended period of time and dies a much slower death including the chance to have a blog entry that is 2-20 months old to generate market interest again. Optionally, you can include double or confirm-opt in to be safe. My gut feeling is that you can get away with single opt in only if you have a CAPTCHA system enabled on your blog comments as that authenticates a human is involved in the process. When in doubt, go confirm or double-opt-in for your comment subscribers. You'll also want to give your subscribed commentors the ability to MANAGE their subscription. When they visit your blog post that they are subscribed to be notified when new comments are added, a cookie or session would recognize them and instead of giving them the ability to subscribe to the thread they are already subscribed to, it would give them the ability to manage their subscription (ie: Cancel it or change their email address). ALWAYS, give your blog commentors the ability to unsubscribe at any time and with one click of a button. You can find a plugin for your blogging platform and install it or you can have a 3rd party ESP (Email Service Provider) manage this for you. It's easiest to implement it as part of your blogging software. If you can't find a plugin for your blogging platform, then pay someone to write it for you. Why do this? 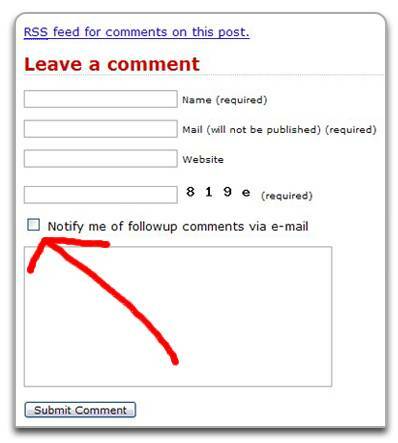 Why give your commentors the ability to be notified via email when its easier to just implement an RSS feed for each comment thread? Because EMAIL is still the number #1 application in the world and RSS is not. I'm a pretty aggressive RSS reader, but I'd rather subscribe via email to comment threads I want to watch that I've participated in so that I don't have to setup yet another RSS feed to track. This is not an impossible to implement strategy and you can get it done. Go for it and give your blog commentors the ability to subscribe via email to any thread or blog post they are adding a comment to. If you want to take this strategy even further, you could give anyone who wants to follow the blog comments in a lurk mode (meaning they are subscribed to future blog comment entries but did not leave a comment on the blog post themselves). Every blog in the world will have this functionality soon due to the powerful market discussions that can take place on auto-pilot while you, the blogger, continue to focus your time on creating quality and timely original blog posts. Will you be the next to add this functionality to your blog? psssst: You can implement this same functionality in non-blog websites. Can you see the possibilities?